Adding to the variety and flexibility of our work, our method is perfect for creating fused glass lighting enclosures where the translucent nature of the glass can be used to its full effect. When our glass is back lit, and this can take any shape, size or form you want it to, the results are stunning. 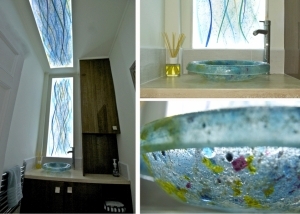 Have a look at some examples of our fused glass lighting below, and you’ll see what we mean! 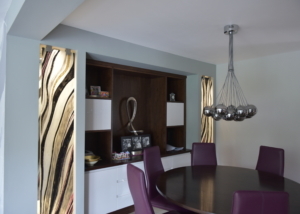 We’ve been creating fused glass lights for a while now and it’s something we started doing after initially creating splashbacks and wall art. We already create fused glass accessories and because the nature of the work is so receptive to light, it only made sense to start created fused glass lights. We’re the best place to get fused glass lighting here in the UK. 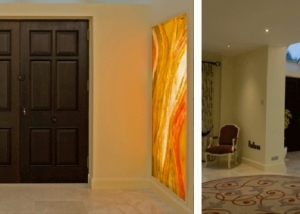 Our backlit fused glass lighting panels make excellent focal pieces for entrances and hallways and the way the light shines through the colours is truly mesmerising. We can create the panels as large as you’d like and can cut them to shape. Our smaller, Rospo fused glass lights look great as centrepieces on a dining table or as accent lighting in any room in the house. 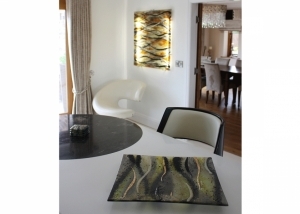 The design works the same as when we are creating wall art; you can buy pre-made fused glass lights or backlit wall panels or you can choose to have your own bespoke fused glass lighting piece commissioned. 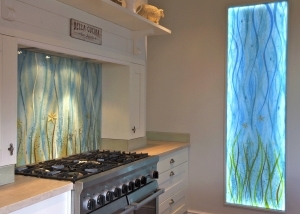 If you want something truly personal and unique to your home then we suggest you opt for the bespoke fused glass lights option and have a think about the type of colours, designs and imagery you would like! 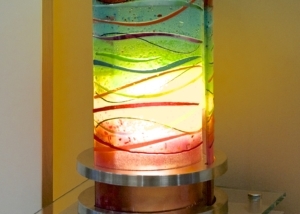 There are many more examples of fused glass lighting in the Portfolio Section to give you some inspiration and ideas of the type of thing we can create. 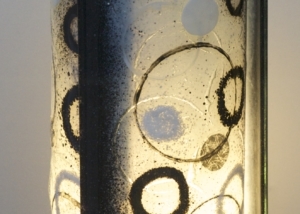 Get started on your fused glass lighting piece today!